October 7, 2010, Biratnagar. Primary Health Care Out Reach Clinic has been started at Keraun- 4 of Morang. 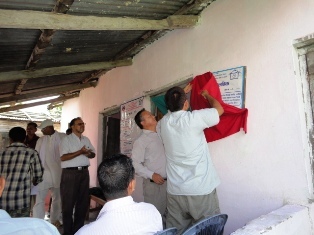 Nawaraj Subba, DPHO and Devendra Dahal, chairman of PHC-ORC management committee jointly opened the clinic in a ceremony. A fund of Rs 20,000 has been collected by locals, mother groups and a local club to run this clinic. Pregnant women, married women, under-five children will get ANC, PNC checkups, counseling, Iron tabs, Antihelmentics, contraceptives and vaccine etc free of cost. Logistics of these drugs, contraceptives, and vaccines will be arranged by the District Public Health Office through local health institutions. Furniture, curtains to the clinic were made available by NFHP. 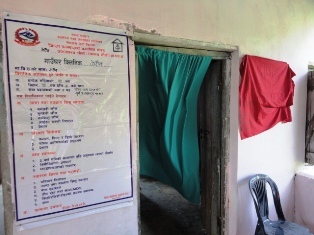 Now, the clinic has been started after the renovation of the old and vacant building that was hand over to local people two decades ago by irrigation project. Chairman Devendra Dahal said that Phanindra Karki has provided 7 dhur land to make clinic building and Dinesh Niroula will provide Rs 6,000 each year for the clinic. In the opening ceremony Sriman Thapa, Bheshnath Rijal, Durga Bahadur Karki, Mukesh Dahal, Devi Prasad Luitel, Buddha Basnet, Hira Tiwari and Mohan sing Limbu made remarks on the PHC-ORC.